The Agence Française de Développement (AFD) and its subsidiary Proparco have been working tirelessly to promote sustainable and inclusive development in India for over 10 years. This insightful article is dedicated to underscore their work in India and Gujarat. The Agence Française de Développement (AFD) is an inclusive public financial institution and the main actor in France’s development policy. It makes commitments to projects that genuinely improve the everyday lives of people. A partner of India since 2008, AFD works with Indian authorities to promote green and inclusive growth. It operates through loans to state and public enterprises, as well as through technical assistance programmes with the goal of supporting sustainable urban development, energy transitions and ecological preservation in India. Sustainable mobility is central to AFD’s action in India where it is financing the construction of the Kochi, Nagpur and Bangalore metros, for total financial commitments of Euro 620 Mn. In addition to infrastructure financing, AFD launched the MobiliseYourCity initiative with three partner cities in India, including Ahmedabad, in November 2018. MobiliseYourCity is a worldwide programme, initiated by the French and German governments at COP21 in Paris and financed in India with support from the Asia Investment Facility of the European Union. It accompanies local and national stakeholders to improve urban planning practices and policies and reduce GHG emissions related to urban transport. The programme in Ahmedabad would focus, over the next two years, on a wide range of innovations with a focus on public transport improvements, improved intermodality, support to non-motorised transport and other alternatives to private vehicular traffic, awareness raising and experimenting of new mobility management tools (car-sharing, carpooling) and pilots for low carbon technology in transport (such as e-vehicle charging stations). AFD is also committed to supporting state and local authorities in meeting the challenges of a growing urban population in favour of smart, sustainable and livable cities. As part of an approach based on sharing of French expertise, AFD is supporting the cities of Nagpur, Chandigarh and Pondicherry (Pudducherry) in the preparation and implementation of their smart city projects. Along with a growing urban services portfolio, AFD is also a partner of the Smart Cities Mission of the Government of India through CITIIS (City Investments to Innovate, Integrate and Sustain) – a challenge process which will select 10 to 15 outstanding smart city projects and will provide funding as well as tailor-made mentoring to improve their sustainability, impact, and stakeholder engagement. In addition to a Euro 100 Mn ODA loan, the technical cooperation is financed through a Euro 6 Mn grant of the European Union through the Asia Investment Facility. Besides sustainable urban development, energy is AFD’s second investment priority, representing 26% of AFD’s portfolio in India with a total commitment of Euro 464 Mn. Its financial instruments, including non-sovereign loans and green lines of credit, support financial institutions and public enterprises engaged in the government’s energy transition efforts. 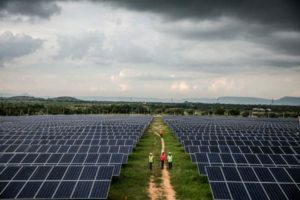 AFD has partnered with the Indian Renewable Energy Development Agency (IREDA) to implement projects led by private developers in the fields of solar, wind, biomass and small-scale hydro projects. Through its line of credit to IREDA between 2011 and 2014, AFD supported development of four renewable energy projects with a total installed capacity of 40 MW in the state of Gujarat (two biomass power projects of 9.9 MW and 10 MW, and two solar PV projects of 5 MW and 15 MW respectively). The estimated annual energy production by these projects is 176 GWh and CO2 equivalent avoided per year is estimated to be 180 000 tons. AFD works in many sectors – health, biodiversity, water, digital technologies, training – and supports the transition to a safer, more equitable and more sustainable world: a world in common. Proparco, a subsidiary of AFD dedicated to private sector financing, has been working to promote sustainable development for 40 years. Proparco provides funding and technical assistance to businesses and financial institutions in more than 80 countries throughout Africa, Asia, Latin America and the Middle East. Alongside its majority shareholder AFD, Proparco has a diversified shareholding: public and private financial institutions from France, Africa, and Latin America, service providers, industrial players in countries where Proparco operates, and philanthropic funds and foundations. In 2017, Proparco committed Euro 1.4 bn to various projects throughout the developing and emerging markets. Proparco focuses on sectors that are crucial to development, such as infrastructure — with emphasis on renewable energy — agribusiness, finance, healthcare and education. Its projects contribute to job creation, supply of essential goods and services and more broadly to the reduction of poverty and climate change mitigation. In addition to financing, Proparco’s role also involves encouraging the emergence of socially responsible and innovative business models in developing and emerging economies. As such, Proparco supports improvements of the ESG performance of its clients. 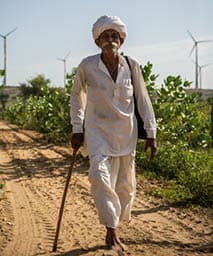 In Gujarat, Proparco is supporting the development of renewable energy by assisting Azure Power, a leader among solar developers and operators in India. Azure Power has implemented one 10 MW project (utility scale) and one 2.5 MW rooftop project (commercial scale) in the state. In addition, NRPPL, another one of Proparco’s beneficiaries, has a solar project of 20 MW (utility scale) in Gujarat. These projects have helped in enhancing the renewable power generation capacity of the country and in partially meeting India’s electricity needs, while at the same time limiting greenhouse gas emissions and reducing the country’s dependence on fossil fuels. Philippe Serres, who graduated from the I n s t i t u t e of Political Studies of Paris (Sciences-Po) and holds a Masters Degree in Development Studies from the London School of Economics, joined Proparco in 2013, first as a Senior Investment Officer in the private equity division, and since the summer 2016 as Head of the Proparco Office for South Asia, based in New Delhi. He has worked at the European Commission Delegation in Peru, at the microfinance rating agency Planet Rating, and as an Investment Officer in AFD’s microfinance team prior to joining Proparco. Clémence Vidal de la Blache, A graduate of Sciences Po (Paris) and LSE (London), is passionateabout working with partners on innovative solutions to urban challenges. Prior to joining AFD New Delhi, she worked for six years as a Urban Development Team Leader in AFD Paris, and four years as a development practitioner in Eastern and Southern Africa.